By Ann Yungmeyer | Photography courtesy of Tom Dulaney, Melissa Campbell, Louisiana Northshore.com, Jake Lynch, Ann Yungmeyer, Melanie Horner, Brenda Moore, Memphis and Shelby County Division of Planning and Development. – for bicyclers of all ages. A well-groomed, peaceful pathway leads ‘over the river and through the wood,’ quietly beckoning us to follow. Into the distance we’ll peddle through scenic meadows and canopied forest, leaving the urban landscape behind. Like countless trains that once chugged along the route, we’ll roll through damp, echoing tunnels and rattle across quaking wooden trestles that stand high over rocky riverbeds. Train tracks long gone, the characteristic setting describes any number of “rail-trails” across the U.S., developed through advocacy efforts of Rails-to-Trails Conservancy (RTC). The national nonprofit organization facilitates partnerships to help communities convert abandoned railway beds into multi-use trails. Since 1986, RTC has supported development of more than 2,000 trails with the mission of “connecting corridors to build healthier places for healthier people.” Through trail development, once sleepy towns are being revitalized as bike rental shops, bed and breakfasts, and whistle-stop cafés pop up near trailheads. In the Mid-South region, RTC statistics show that Mississippi has 110 miles of known rail-trails to date; Tennessee has 136 miles; Arkansas has 73 miles; Louisiana has 134 miles; and Alabama has 87 miles of rail-trails. Expansion projects are happening in all five states to complete rail-trails and connect greenways. Planning is underway for several major developments: Arkansas’ Southwest Trail, a proposed 65-mile trail between Little Rock and Hot Springs; the 100-mile Louisiana Bootlace Trail Network from Baton Rouge to the Mississippi Gulf Coast; and the Mid-South Regional Greenprint, a long-term proposal to connect parks and greenways throughout Greater Memphis and surrounding counties. Rail-trails are popular with cyclists as well as walkers, joggers, skaters, and equestrians (in some areas). With terrain that is generally flat or slightly graded, the trails are suitable for recreationists of all skill levels. Surfaces are either paved or covered in crushed stone with occasional grassy strips. Restrooms are commonly found at trailheads. Some urban trails are quite short but they often link to city greenways and linear parks, while other pathways are developed as long-distance trails, such as Missouri’s Katy Trail. At 240 miles, it is the longest continuous rail-trail in the U.S., running nearly the width of the state along part of the Lewis & Clark National Historic Trail. Regardless of trail length, users can easily make out-and-back excursions, and those wanting to cover greater distances will often leave cars at a starting or ending point and shuttle back. As with all multi-use trails, safety is emphasized, and trail users should always be alert to other users and at street crossings. Though rail-trails are fairly wide, cyclists are advised to ride single file and expected to call out when passing. Trail devotee Melanie Horner of Kingsport, Tennessee, coordinates and plans weekly rides for an enthusiastic ladies biking group in her region of Northeast Tennessee and Southwest Virginia. “We like rail-trails and greenways for safety and relaxed riding, also for trailside amenities and parking,” she says. In addition to riding locally, the group has explored trails in Alabama, Florida, Georgia, Ohio, South Carolina and West Virginia, including some Hall of Fame trails recognized by RTC for outstanding scenery, historical significance, community connections, and other merits. Whether you’re looking to take a quick spin or to discover a new destination for biking, here is a sampling of Southern favorites. (Hall of Fame trails are marked with an asterisk. Alabama, Chief Ladiga* – From Anniston to the Alabama/Georgia state line, the 33-mile asphalt trail passes through small towns and quiet countryside. Following a former CSX railroad corridor, it is named for the Creek Indian chief who signed the 1832 treaty surrendering the tribe’s land. Arkansas, Delta Heritage River Trail – Rural landscapes of the Delta dominate the 21-mile section from Lexa to Elaine and another 14-mile stretch from Arkansas City to Rohwer, part of a larger 85-mile rail-trail project under development by Arkansas State Parks. Arkansas City trailhead has a replica of a historic depot and park facilities. Florida, Pinellas Trail* – Stretching 49 miles from St. Petersburg to Tarpon Springs, Pinellas is a beautifully paved, flat ride with Gulf Coast views and a wonderful rest stop in the town of Dunedin, a charming spot to have lunch and browse. Pinellas is part of the Coast-to-Coast Connector, a developing trail network across the state. Georgia, Silver Comet* – The 61-mile paved track from Smyrna to the Alabama line (connecting with Chief Ladiga Trail) follows the old Seaboard Air Line rail corridor. One of Georgia’s most popular and busiest, particularly on the Smyrna/Atlanta end, the trail is named for the luxury passenger train that operated from New York to Birmingham until 1969. Louisiana, Tammany Trace* – North of New Orleans across Lake Pontchartrain, the 27-mile Trace leads through mossy oak and pine forest and quaint towns including Abita Springs, home of the famed Abita Brewpub, where you can enjoy a trailside lunch. Don’t miss a stop at the quirky H.J. Smith and Sons General Store and Museum. Mississippi, Tanglefoot and Longleaf Trace* – The paved 44-mile Tanglefoot (named for a historical narrow gauge engine) runs along the former Mississippi-Tennessee Railroad, built by William Faulkner’s great-grandfather in 1872. Tanglefoot has parking and facilities at New Houlka, Algoma, Ecru and Ingomar. To the south, the paved Longleaf Trace (43 miles) runs from the University of Southern Mississippi at Hattiesburg to Prentiss, traversing urban landscape and rural farmland. A designated National Recreation Trail, it follows part of the former Mississippi Central Railroad line. Tennessee – Shelby Farms Greenline and Big River Crossing – The 11-mile asphalt Greenline follows a former CSX line under a canopy of large oak trees and passes by Shelby Farms Park. Big River Crossing, opened in 2016, connects downtown Memphis with West Memphis, Arkansas, along the north side of the Harahan Bridge. South Carolina, Swamp Rabbit– Connecting the pretty town of Travelers Rest to Greenville, the 20-mile asphalt trail follows the path of the old Carolina, Knoxville and Western Railway, a train that allegedly “hopped” over rough wetlands and was nicknamed “Swamp Rabbit” by passengers. Route highlights include Furman University, the urban waterfalls of hip downtown Greenville, and Lake Conestee Nature Park. 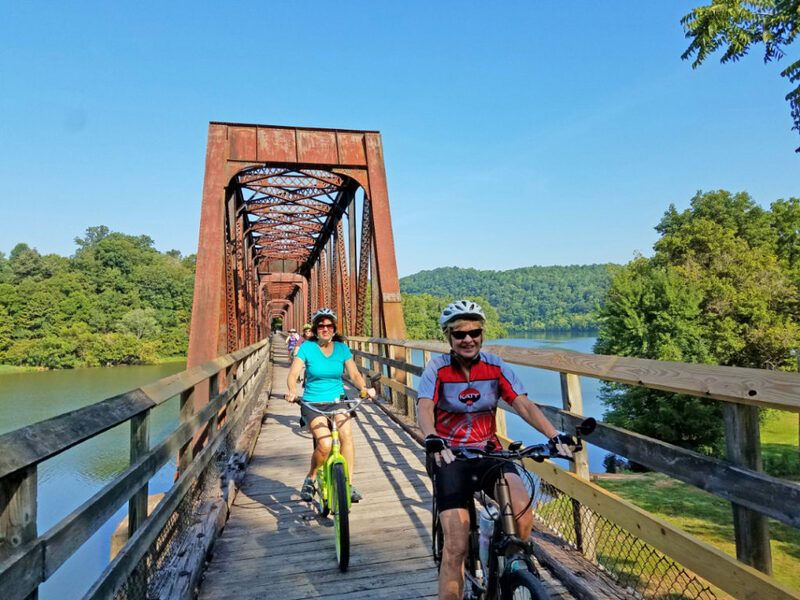 Virginia Creeper Trail* – Arguably one of the prettiest trails, the 34-mile graveled path from Abingdon to Whitetop Station features rushing streams, idyllic countryside, nostalgic locomotives, and 47 trestles. The stretch up Whitetop Mountain is quite steep and many people shuttle up from Damascus and ride downhill. West Virginia, Greenbrier River Trail* – A premier trail for wilderness views, the 77-mile graveled pathway follows the meandering Greenbrier River. For a slight downhill grade, ride north to south from Cass Scenic Railroad State Park to North Caldwell near Lewisburg. You’ll see old rail depots, historical markers, and long tunnels. Read More in DeSoto Magazine online. Copyright © 2019 Desoto Media. All Rights Reserved.